Today's computing environment is more dangerous than ever. Modern threats take advantage of the increasing attack vectors presented by the explosion of interactions users have with personal and business data, devices, and applications. Today's malware often uses very stealthy techniques, which conceal their malicious code, often going undetected until damage has been done. 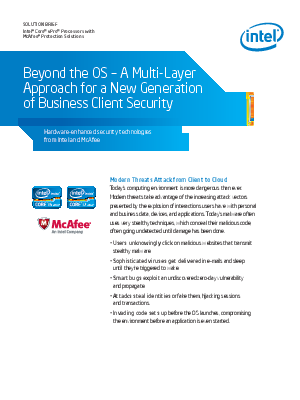 McAfee and Intel create a multilayer endpoint protection against malware, helping protect business PCs against intrusions from security breaches. Read this white paper to understand how it can strengthen your company's security strategy.